A fire erupted at Notre Dame cathedral in Paris on Monday, according to local authorities. Footage posted on Twitter shows flames and smoke billowing out of the roof of the famed, 850-year-old building. 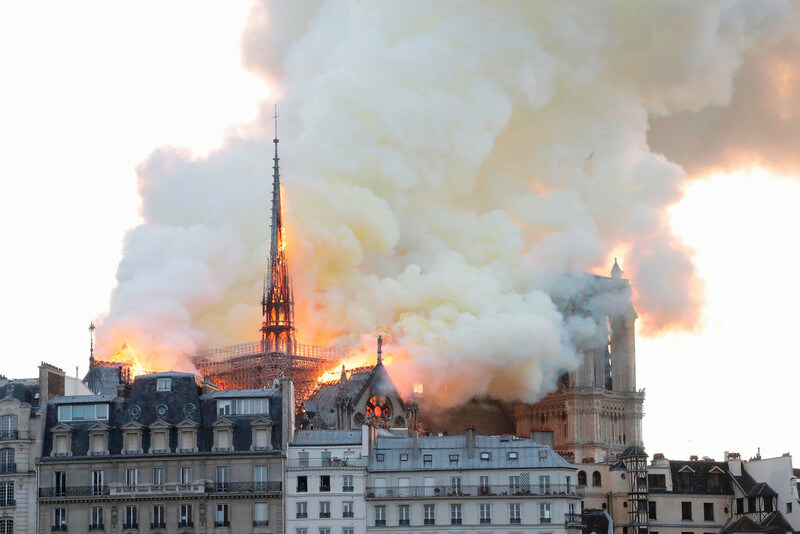 The blaze broke out in the attic of the cathedral and was first reported just before 7 p.m, local time, according to Le Monde. The cause of the fire was not immediately clear, but officials could be related to renovation work, according to the BBC. This entry was posted in Current Events, News International, Uncategorized. Bookmark the permalink. The 300 foot spire just collapsed. Oh no! I just got home and this is the first I’m learning of this 💔. It’s so sad. So much history gone. Praying it can be restored. Me too. what a horrible thing to happen. This makes me sad, whatever the cause. I am somewhat comforted when I think of how Windsor Castle burned and was restored. As I watch, I am hoping they can do that with the Notre Dame. I am sure there are some things that will be lost that can’t be replaced, though. The fire looks terrible. I wonder what they are fighting it with? Do they have planes over there, water tankers, like we do here? POTUS is right, that is what they need. I just heard a fire chief from New Jersey talking about that. He said that they wouldn’t be able to get a plane low enough in a city, and that the weight of that much water would cause additional destruction to the building. He also said that water from above really wouldn’t have been useful prior to the roof coming down because it wouldn’t be touching the fire which was protected by the roof. Immediately after Katrina we had a large number of fires, more than a few were suspicious. As most of the firehouses and trucks were lost in the flood a number of cities sent trucks and crews here and we had airdrop aircraft. The converted military Skycrane helicopter was here and I watched it drop many buckets of water on burning buildings and not once did the water cause damage, it depends on how the water’s dropped. Even then the question is: what is going to cause the most damage, the fire or the water? I don’t buy his explanation, I just don’t think France has the fire fighting capacity the US does. I’m sure the have the building documented down to the last finial and gargoyle, it’s just such a treasure that they couldn’t afford not to – even the French. In 1988 the Cabildo in the French Quarter, built in 1795, caught fire. The fire destroyed much of the roof and 3rd floor but the state had minutely detailed blueprints and pictures of the building inside and out,. The rebuilding took 6 years, it took that long to find/create exact replacements, right down to the air dried cypress beams as suitable trees had to be located, cut and dried. 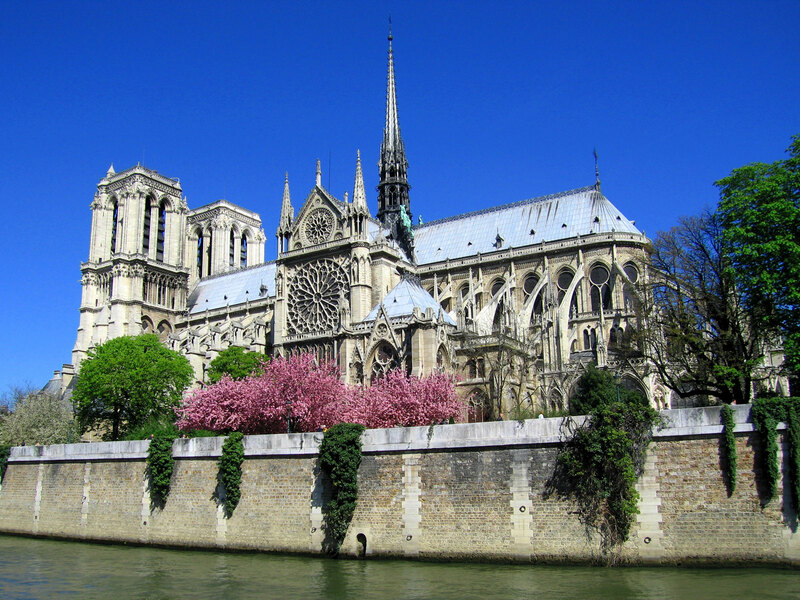 I’m sure that the French, and others, will do what it takes to rebuild it exactly as it was pre-fire. Thank you. I read somewhere that the French poo-pooed the Prez’s suggestion because the water would damage the building. Because fire never damages buildings. Well the French are good at making excuses…take the failure of the Maginot Line for instance. Then there was the collapse of the French Empire. The US has a lot of open land so our fires can be really troublesome, hence the proliferation of firefighting aircraft. Ditto Canada. Many European countries can fit inside of US states so it’s an economy of scale issue I bet, but I’m thinking their attitudes may change after this and they’ll start getting helicopter-fittable equipment from US suppliers. Then again Europe never seems to learn its lessons. I think the ongoing stress from my job is getting too me because czar, I read that and cracked up. Well the Maginot Line would have worked if the Germans had played fair and not gone around it! But who would have ever thought…? I walked part of the Line in the early 60s with a Wehrmacht vet, he’s the one who showed me on the ground and on the map the glaring error the French made in designing it. Same with Fort Eben-Emael, it was touted as impregnable until German glider troops took it in one day. Oops. He was talking about planes, not helicopters. They are saying now that the inside will be a total loss. Whatever the point of combustion…it is man-caused. One thing sure, every jihadi on the face of the earth is cheering. They’ll probably be handing out sweets like they did on 9/11. Idiots. There will be those who doubt they would/could have started the fire and the press would have come to their aid had anyone suggested they had a hand in it but they had to go and shoot themselves in the foot. Let them reap the results of their own stupidity. Get them the hell out of our country. No one was hurt or killed, so that is great news. Many of the statues and relics had been removed for renovations. So sad for France and Catholics. Thx for posting this, Stella. Pres Trump recommended flying tankers like we have. The planes could refill in the river, but apparently France hasn’t any. So sad. Just heard a fire chief say that they wouldn’t be able to get low enough in a city, and that before the roof collapsed, the water from above wouldn’t reach the area that was burning. Also, water weight all at once like that would probably damage the building further. Again, wrong. The helicopters (cheaper than tankers) can be fitted with baskets that are dipped into the river and can be rapidly moved back and forth between the water source and the fire. The equipment can be rapidly fitted onto military helicopters as well as civilian, all you need is a trained pilot. French just don’t have the equipment, I bet, now they’re suffering for it. Like I said, he was talking about planes – as was President Trump. Not helicopters. Just responding to a reporter who asked about what the President had suggested. It doesn’t matter anyway, since they didn’t have either one, it seems. I’m sure if they did, they would have used it. Like I said, it’s the altitude that counts. A plane could get low enough – B-52s used to raise dust in Wyoming practicing low-level attack patterns. Most European countries don’t have them though I do believe the German military has some firefighting equipment that’s airborne. The planes only need enough straight-line water access to taxi in, fill on the run and be able to take off again. I think Pres. Trump was right………..they needed tanker planes to drown it from above. And, it is on an island. Would have worked, seems to me. If it was a helicopter, maybe. How would the plane pick up water from the river, with all of the bridges? They don’t hover. Maybe the French will finally strike back. No chance. Individuals maybe. The country? Don’t think they’d be able to muster up a real patriotic and common sense defense of their own interests if St. Joan of Arc came down from heaven to lead them. As far as I am concerned, they opened the door wide for this and begged for it. That being said, I am reserving judgement on the cause of the Notre Dame fire, but with the things that have been done to the other churches in the past weeks the point is still valid. Paris Match reporter confirming most of the statues, relics, and paintings, including 15 copper statues, have been removed. Those that were left in the cathedral were removed at the outbreak of fire. Good news. Jihadis have been plotting all along…such an incredible coincidence??? Good news. Main structure of both buildings can be saved, and The Crown of Thorns has been saved. A UNESCO architect, who has studied the wooden supporting structures from the inside, says they can be restored. The spire was previously restored, 1500s iirc, so that might be able to be reconstructed as well. Yay~!!!! Good news! It would have been better if this had never happened, but if it can be restored, that’s fantastic!! In 1944 as the Allies were closing on Paris Hitler ordered the city of Paris burned to the ground as not only a delay to the advancing Allies but as a sign of his anger. His General in charge of Paris, Dietrich von Choltitz, refused to burn the city that he so loved and surrendered it intact to the Free French forces. YTou’ll see references to ‘not even the Nazis damaged Notre Dame’ but the Nazis (as in Hitler, head of the Party) ordered the city destroyed like Warsaw, it was a military general who saved it. So I take it the General was not a member of the party, then? Just a regular Wehrmacht general with no affiliations to the flavor of crazy of the time? Many high-ranking officers weren’t Party members though starting in the early war years many junior officers were. You have to remember that many officers in the Wehrmacht were WWI vets and had a solid enmity towards the Allies and especially Russia. My grandfather was recalled to active duty in the mid-30s because he’d been an Engineer officer in WWI and a Russian POW. He spoke Russian, had a knowledge of Russian tactics and terrain and, really important, hated them to his very core. He wasn’t alone. He was never a Party member even though he made Generalmajor by the end of the war. History has become prisoner of politics. Few know that very soon after the war many German Wehrmacht personnel were accepted into the postwar German military, the French Foreign Legion and even the American Army. Hans Rudel, famous Luftweaffe stuka pilot and unrepentant Nazi, was at a seminar in 1976 where he lectured US pilots on how to attack Russian Tanks. Then there were the records of horrific tests done on inmates in the concentration camps that the Allies (US included) in many programs after the war. And can we ever forget Werner von Braun, whose V-1 and V-2 rockets caused such death and destruction, without whom it would have taken us much longer, if at all, to get to the moon. All times have their own crazy. I have heard, in the course of my WWII research, that the German Military could have taken or left Hitler. He was apparently the excuse they needed to right the perceived wrongs from the first war. Werner von Braun…wasn’t he the one who, with his team, surrendered to the US after the war so he could keep working on his rockets? I seem to recall some German/Nazi-affiliated researcher who did surrender right as Germany was losing the war, and I don’t recall America interfering with his research at all. Von Braun and his crew surrendered, along with their research, to the West while part of his team surrendered to the Russians. The ones who surrendered to the Russians were treated like **** while von Braun and his guys became royalty. You look at US rockets and missiles up to and including the Saturn 5 and there are German WWII rocket scientists’ fingerprints all over them. The Wac Corporal US rocket was a V-2 spawn as was the Russian R-1. We had von Braun, they captured Helmut Groettrup. Were it not for Hitler’s rocket program neither nation would be where it is today. Mark Steyn on Tucker Carlson just had the very best commentary on the loss of Notre Dame. Steyn commented on the reason for building such magnificent structures in the past was as a monument to Our Lord, something we never do now, and finished by saying the loss and hole in our hearts everyone is feeling is the loss of our relationship with Our Lord. Wise words from an otherwise very funny man. From earlier today…Dr. Steve Turley…. Notre Dame Cathedral on Fire: Here’s What We May Have Lost! Messed up the italics, sorry.